FLEXPOINT® laser modules are produced at two locations in Germany: Blau Optoelektronik GmbH and Laser Components in Olching. Our strength lies in the production of custom & OEM modules: You provide us with your specifications in terms of wavelength, beam profile, power level, housing, connection, and power distribution and we will customize your module. Laser modules have been manufactured at our headquarters since 2010. Blau Optoelektronik and LASER COMPONENTS work together on production, and our customers profit immensely from this collaboration. The highest quality is available in the shortest delivery times. Whether ordering single pieces, small series, or large series with more than 1,000 pieces, each individual request is processed reliably. Together we will find the optimal solution for your application. And at prices that will prove to be a pleasant surprise. Why use a FLEXPOINT® Laser Module? Because these modules are quite simply the best! 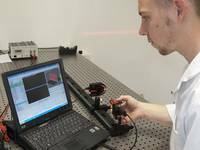 By manufacturing the FLEXPOINT® modules in Germany, we can offer lasers of the highest quality. All modules have an isolated housing. That is to say, the operating voltage is not connected to the housing. This guarantees an unproblematic (electrical) assembly of your system. All modules are protected against an inversion of + and -. In the FLEXPOINT® modules only electronic circuits are used that are developed by us and not somewhere in the Far East in mass production. Each circuit contains a safety feature to protect against surges and voltage peaks. All FLEXPOINT® modules are CE certified and conform to RoHs regulations. The laser class of each module is specified according to DIN EN 60825-1. Our product engineers will be more than happy to advise you on laser safety regulations. 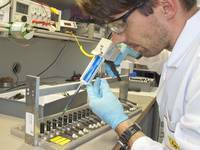 Florian Gerg, certified as an electrical technician, heads the optoelectronics production groups. His vast experience in assembly and packaging technology ensures reliable and novel customer-specific products.